This clock also plays music. One of 12 tunes will play after the cuckoo calls. It even features a photo sensor, where it will turn off the sound when it is dark. Even the packaging has old-world charm, as only paper is used. The factory packing is all made with renewable materials. This clock makes a great gift for the young and old alike. 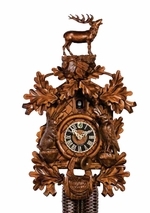 This clock would be perfect for bird, animal, or nature lovers. Click here for closeup pictures 1 2 3.